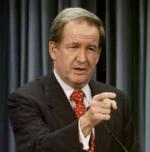 Note from the editors: We reprint below Patrick J. Buchanan's Foreword to the second edition of Justin Raimondo's 1993 book, Reclaiming the American Right The Lost Legacy of the Conservative Movement. What happened to the American Right? What became of a movement once so united and disciplined it could deliver the presidency, consistently, to the Republican Party? That the old house is divided, fractured, fallen, is undeniable. The great unifier, Ronald Reagan, is gone. The cold war that brought conservatives together, is over. With the Berlin Wall down, the captive nations free, the Evil Empire dissolved and subdivided, many on the Right have stacked arms and gone home. Once there, they have discovered that we come from different neighborhoods, honor different heroes, believe different ideas. To understand the new rifts on the Right, scholars have begun to research its history, explore its roots. Latest to do so is Justin Raimondo, who, in this book, argues that conservatism is a cause corrupted and betrayed. His is a story of heroes and villains, heresies and excommunications, faithfulness and betrayal  a veritable Iliad of the American Right. Raimondo's book goes back sixty years to the days when the Old right first rose in rebellion against the New Deal and FDR's drive to war. Believers in limited government and nonintervention, the Old Right feared involvement in a second world war would mean permanent disfigurement of the old republic, and a quantum leap in federal power that could never be reversed. But history is written by the winners. And these men lost it all: jobs, careers, and honored places in their nation's memory. But they never lost their principles. Garet Garrett, John T. Flynn, Frank Chodorov  who has heard of this lost platoon of the Old Right? They went down fighting and ended their lives in obscurity, resisting the clamor to sign up for the cold war. Theirs, declares Raimondo, is the lost legacy. And the failures of conservatism are traceable to the Right's abandonment of that legacy. Beginning in the mid-fifties, the Right was captured and co-opted by the undocumented aliens from the Left, carrying with them the viruses of statism and globalism. First in from the cold, Raimondo writes, came the Communists, refugees from Stalin's purges, from the Hitler-Stalin, and Moscow's attack on the Baltic republics and Finland. First among these was James Burnham, ex-Trotskyist of whom Orwell wrote that he worshipped power. Burnham went o the masthead of National Review from its founding in 1955, to become grand strategist of the cold war. He would be awarded the Medal of Freedom by Ronald Reagan himself . . . but, Raimondo argues, Burnham was never a true conservative; indeed, was barely tolerant of conservatives. A Machiavellian after renouncing Marxism, Burnham preached "American Empire" as the necessary means to combat Communist empire and was first to call for the creation of a "democratic world order." A second wave of migrants was the neoconservatives. Though Trotskyist, socialists or Social Democrat in their youth, by the mid-sixties they were JFK-LBJ Democrats orphaned by a party dedicated to the proposition that Vietnam was a dirty, immoral war. In 1972, they signed ads for Richard Nixon, a man not widely cherished among their number in his Alger Hiss and Helen Gahagan Douglas days. With Reagan's triumph, the neocons came into their own, into his government and his movement. Raimondo echoes the Old Right journalist who calls the neocons the cow-birds of conservatism, migratory fowl that wait for other birds to build their nests and lay their eggs, then swoop down, barge in, and kick the first birds out. If conservatism has failed, he writes, it is "because a Trojan horse inside the movement has been undermining the fight against big government. Since the mid-fifties . . . these interlopers have acted as a Fifth Column on the Right: conciliating the welfare state, smearing their Old Right predecessors, and burying the real story of how they came to claim the mantle of conservatism." And today? "Two traditions stand head-to-head, contending for the future of the . . . movement. One piously holds out the promise of enterprise zones from South Central Los Angeles to Mogadishu, while the other dares utter the forbidden phrase, America First!" Written in defense of, and in the style of, the dead lions of the Old Right whom Justin Raimondo reveres, Reclaiming the American Right is not about olive branches; it is about conflict, about taking back the movement, about taking back America. Richly researched, beautifully written, passionately argued, Reclaiming the American Right is targeted at the "new generation of conservative theorists and activists [that] yearns to get back to first principles and get in touch with its roots." Many will call this revisionist history of the Right, but even those who work for consensus need to understand how those who do not believe, feel and think. And the timing is perfect. For, suddenly, all the new issues before us, Bosnia, Somalia, foreign aid, NAFTA, intervention, immigration, big government, sovereignty, bear striking resemblance to the old. You can get Reclaiming the American Right, while the supply lasts, by making a donation of $50 or more to Antiwar.com. Just go to our secure credit card server. Or send your check or money order to the address below.